Loyalty programs act as a way to entice purchases at their specific gas retailer. The savings are relatively minimal (1/2% – 2%) for regular gas. It is usually not worth changing your fill up habits because of these. Canadian Tire Gas+ returns Canadian Tire Money and has no value to most people. Earning rewards requires paying cash / debit or Canadian Tire Options Mastercard. 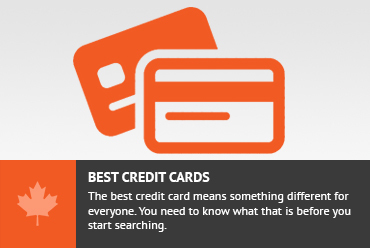 You must sacrifice credit card points you might have earned using a good credit card. The Canadian Tire Money earned does not make up for the loss for most people. Gas is expensive. Unless you own a fully electric vehicle, your car needs gas to get around, and there is no way to get around the reality of rising fuel prices. There can, however, be some consolation in picking up a few perks as you pump away. Personally, I drive a Toyota Corolla. In 2014, if I drive 20,000KM, I’ll likely spend $2500 on regular gas this year. I typically choose where to fill-up based on price and convenience. Since gas retailers don’t want us shopping based on price, they try to entice us to their outlets with loyalty programs. These loyalty programs give rewards that equate to about ½¢ – 3¢ per litre for regular gas, depending on how savvy you are when you redeem the rewards. Higher grades of gas earn much better rewards. The most reward value I would get for my $2500 gas budget this year is 5 car washes, but I could take a $17 discount on gas instead. These benefits aren’t enough to significantly change my behaviour, but since there is no cost to earning the rewards, I might as well take a few free car washes along the way. Of the 3 major gas retailers in the Toronto area, the Esso Extra program has the most reward potential, with the best use of points being on car washes. Even for gas discounts, it gives a better redemption value than the other gas loyalty programs. Esso offers the option of earning Aeroplan miles instead of Esso Extra points, but most people will derive more value from the Esso Extra points. Besides which, your car might get jealous if you fly. If you’re partial to Petro Canada, you can earn Petro Points. Again, the best use of these is car washes, but if your car is already squeaky clean, you can also use them for fuel discounts. The optimal way to discount gas is by using a reloadable Price Privilege card which offers a fixed cent / litre discount on a specified number of litres. Shell takes a different approach to loyalty and offers the third-party Air Miles reward miles. 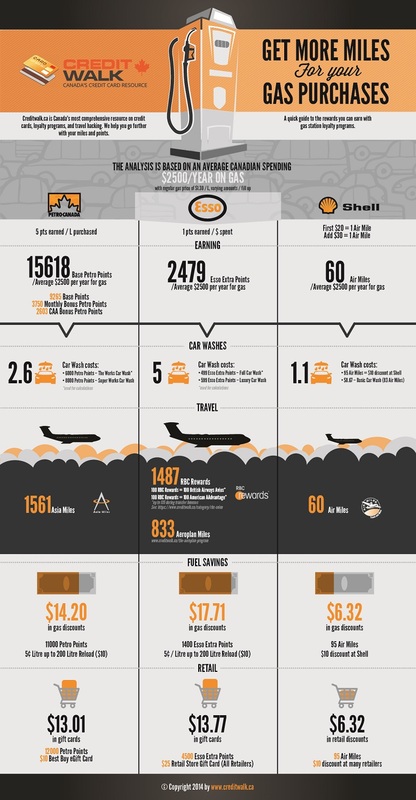 The earning rates at Shell are separated by tiers: 1 Air Mile for the first $20 spent and 1 Air Mile for each subsequent $30 spent. Precision pumpers will know to fill up exactly $50 or $80 to maximize their take. Air Miles can be redeemed as an instant discount at any affiliated retailer, including Shell. For comparison purposes, my $2500 annual spend would get me around $10 worth of discounts at Shell, whether I spend it on car washes, fuel or candy bars. While Esso, Petro Canada and Shell offer rewards regardless of payment method, Canadian Tire’s gas bar only rewards you if you use the Canadian Tire credit card or pay with cash or debit. These rewards take the form of Canadian Tire money and are based on an earning schedule. Base earnings are small, but bringing a multiplier coupon dramatically increases the rewards. Assuming an average multiplier coupon of 7x, my $2500 annual spend could earn a gas discount of about 2¢/litre, but this entails sacrificing the more valuable rewards I would have earned from my credit card. Canadian Tire Gas Rewards Overview. In short, gas bar loyalty programs offer a small reward for choosing to fill up at their stations. Their value may not trump the appeal of convenience or price, but since my car needs gas anyways, I might as well keep it clean by earning some free car washes along the way. You should do a write up on Superstore, my local station gives 3.5c/L back in Superbucks or 7c if you use a PC debit/credit card. That is a great deal. I havent seen that at my local Esso or Superstores. I guess that would be a regional thing? Right now, the only promotion I see at Esso / PC brands is a coupon for a few cents off / L at Esso when you shop at Zehrs and Loblaws. You get more cents off depending on how much you spend. All the advertising looks like it is expiring on Sept 30 so it seems like a short term promotion. It is good to know that there are these promotions available in certain places all the time. Yes you’re right, it may be a regional thing. I’m in Edmonton. I’ll try and get some pictures, seems like all Superstore and Esso stations here have those promotions. what about comparing Esso to Costco gas station? Which one in your opinion is the most worthy to get more mileages? Costco doesnt have any type of loyalty program that I am aware of (with respect to gas). My experience is that Costco wins on price pretty much always and by more than the 1-2% that Esso might give you in loyalty. If you are indifferent between Esso and Costco, likely Costco is going to be cheaper and you are better off with that. How about the Canadian Tire Gas Advantage MC? You do not get CT Money as a rebate, gas price is removed automatically when filling. Based on the total spend of the previous month you get money off gasoline per liter. Two of us use this as our primary card, and charge monthly utilities and cell phones bills to it, as well as groceries and any thing else. CT and Mark’s Work Warehouse purchases receive double value in the calculation. When $1000 is charged to the account the previous month 8 cents a litre is subtracted with every fill up to $500 spent at gasbar (so don’t be charging things bought at the store!!) a month of gas. If $2000 a month is charged, then 10 cents is automatically removed per litre when paying at the pump (or inside otherwise). We usually charge over $2000/month and use a lot of gas with our commute, so we figure are saving up to $50/month on gasoline. As a CT gasbar is convenient to our home, we feel we have the best card with no fees. Don't subscribe All Replies to my comments Notify me of followup comments via e-mail. You can also <a href='https://www.creditwalk.ca/comment-subscriptions/?srp=3223&srk=2648578ecea05c83754707575dc5a494&sra=s&srsrc=f'>subscribe</a> without commenting.